Paul Saint-Amour, Walter H. and Leonore C. Annenberg Professor in the Humanities & Professor of English, has been invited as a speaker at the English Institute 2016. 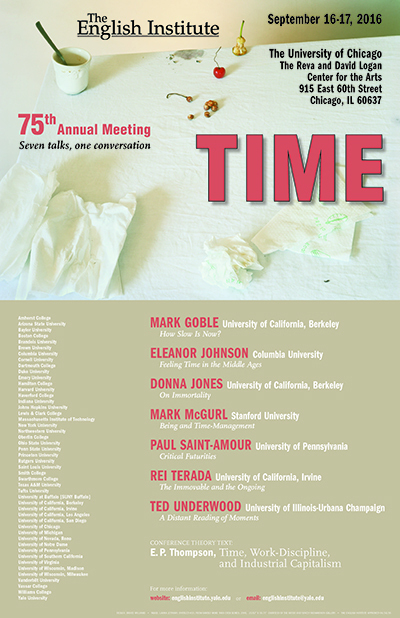 The conference is their 75th annual meeting and will take place at The University of Chicago on September 16-17. The theme of Time is supported by the conference theory text of E. P. Thompson's Time, Work-Discipline, and Industrial Capitalism. Professor Saint-Amour will present on "Critical Futurities." His talk from the conference was published in summer 2018 in a special 2016 English Institute cluster in the journal ELH.